Once the nerve center of commercial traffic on the canals, the Bassin de la Villette is now a lively hub of cultural and leisure activities. Bassin de la Villette was a former port during the era of industrialization of rivers and waterways for transport trade in Paris. Highly known for its commercial and industrial purpose, it is nowadays an animated "full of life" venue hosting many cultural events. 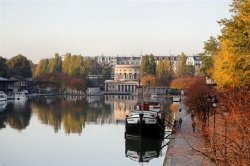 Bassin de la Villette was inaugurated in 1808 by Napoleon Bonaparte and was popular for leisure activities: the place to go for a walk with the children, families and friends; to sail along the banks and fish. The park is an invitation to enjoy outdoor sports and leisure walks. Bassin de la Villette, the social market industrial economy in Ile-de-France was based on its waterways to improve life using all high level skills and innovations at that time. In the 1820’s, this small village that provided cereals, vineyards and orchards changed due to the digging up of the waterway’s system of Canal Saint Martin. Napoleon decided to order a Napoleonic-era-immense project to transport freight and supply Paris with drinking water. This small farming village turned into a busy port which attracted many industries. It became the favorite transit hub for food and meat industries with slaughter houses. "La Compagnie des eaux and Magasins Generaux" was known for their great and massive industrialization of livestock markets of meat suppliers and gasworks. In the 1950’s, the fate of this village changed once more due to another massive decentralization of industries which the Parisian waterways underwent; it resulted in an immense impact on livestock industries: many warehouses were abandoned or destroyed. In 1973, the site was definitively deserted and all the slaughter houses suffered from the consequences of this closure. Paris hosts a remarkable stretch of water of 700 meters long and 70 meters wide which has undergone a very real revival: people enjoy a stroll along the banks, barges are transformed into cultural venues and warehouses are converted into cinemas, hotels and restaurants. Bassin de la Villette, the biggest artificial body of water underwent a huge scheme project to convert the wasteland into clear objectives. It now fulfills a triple artistic, cultural and popular art and science spirit for Paris and its suburbs. It has been converted into a very festive popular place full of life ideal for strolling, having a picnic or stopping over at one of the many bars or restaurants. A large cinema-complex showing quality movies is a joy for film lovers. MK2 cinema housed in a former warehouse is located in the area of Stalingrad district. All year round Bassin de la Villette is considered as a new cultural centre where people can enjoy many scheduled performances such as exhibitions, festivals, short film sequences which confirm its character of a new modern venue in the North East of Paris. Bassin de la Villette is also used for boating and sailing as well as other water activities. Two famous companies: Paris Canal and Canauxrama organize luxury and leisurely Paris seightseeing cruises to see Paris from a boat all year long. A water-sports complex offers Parisians and visitors the opportunity to enjoy water-sports activities ; kayaking, pedal-boats and rowing. A new marina with all practical amenities capable of accommodating boats up to 15 meters long was opened in 2008. Marin d’Eau Douce Company proposes the rent of small electric boats. Bassin de la Villette is concurrently a base for all cultural and sporting events taking place throughout the year; it is also advantageous for the organization of festivals and events. Since 2007, it has hosted Paris Plages - a summer event. Since 2017, it is now possible to swim in three pools especially built for the occasion. Every summer, Bassin de la Villette and its banks accommodates the event for a whole month. The banks are transformed into a sort of seaside resort offering all amenities provided free of charge to all visitors and Parisians: deckchairs, kindergarden secured square, climbing frames as well as water based activities for all. Enjoy a coffee on the wooden floating café-terrace before going to the petanque strip pitch. A picnic area and a dance floor for summer local dance festivals are a must to enjoy a fantastic summer day out without taking the car and with just a metro ticket. 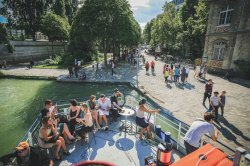 During the entire summer festival, away from the hustle and bustle of busy highways, Paris Canal and Canauxrama boats shuttle back and forth on Canal de L’ourcq from Paris - Plages at the level of Bassin de la Villette to Bondy and Aulnay Sous Bois through beautiful landscapes. Several out-of-the-ordinary attractions can be visited on the way: Parc de la Villette, the district of Pantin - Grands Moulins as well as the National Dance Center. Many boating activities and watersports activities are also proposed for adults and children. Enjoy an original wonderful opportunity to discover the urban and semi urban side that reveals the street art in Seine Saint Denis. In 2009, the summer festival hosted festivities for the celebration of the 200 years of Bassin de la Villette. A series of cultural, sporting and festive highlights gave pride of place to this largest stretch of water with a rich and varied events program. All the different aspects of Bassin de la Villette about the present, the past and the future were related through the different events and festivities. Bassin de la Villette hosts the former warehouses of Magasins Generaux which were used in the XIXth century for the storage of agriculture productions and raw-materials. It is now a famous youth hostel called Saint Christopher’s youth hostel which includes 275 beds and some private rooms, as well as an internet café and two small auditorium venues for shows. A 3-stars hotel, Express by Holiday Inn –Canal de l’Ourcq 144 rooms is also located on its banks as well as the French seafood restaurant called la Criée which has a stunning view on the canal. 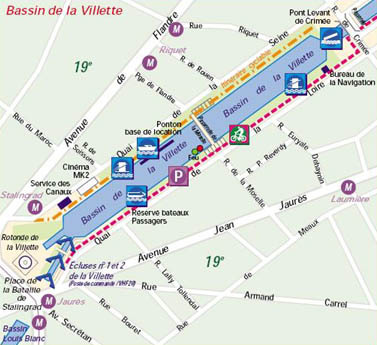 See the full list of hotels near the bassin de la Villette or browse our Hotel in Paris 19th arrondissement page.